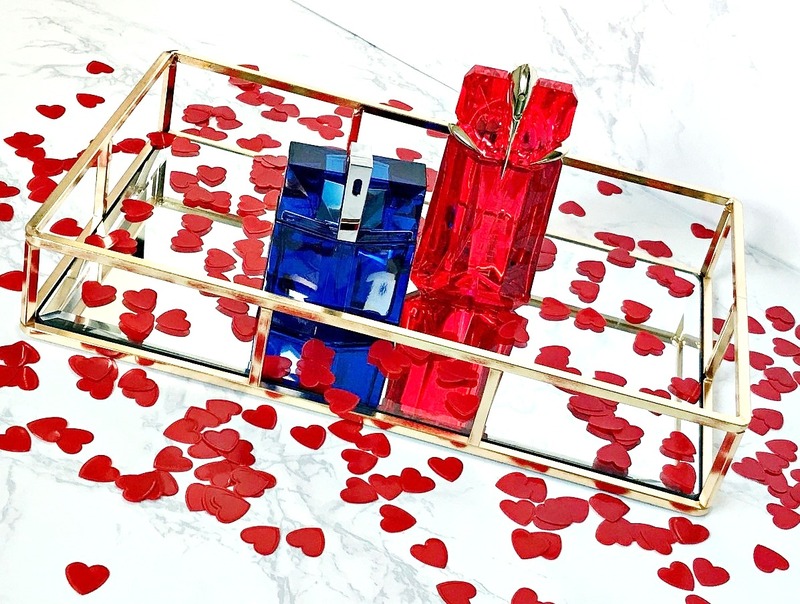 Mugler Alien Fusion For Him & Her - perfect for Valentine's Day! With Valentine's Day fast approaching, it's time to start thinking about what to buy your other half - if you do gifts, that is! We always exchange cards but are irregular with gifts - some years, we'll buy each other something, other years, it's a takeaway & cosy night at home. One thing that both my husband and I are both big fans of, is fragrance - it's an everyday essential whether we're going out or staying at home. Today I want to share Mugler's latest fragrance releases for him & her: Alien Fusion Eau De Parfum and Alien Man Fusion, which may serve as some inspiration if you are in the market for a new fragrance or want to buy a new smelly for your other half for Valentine's Day! Alien Man Fusion: Described as having a combination of hot and cold notes combined (hence the fusion name), this fragrance definitely lives up to its name. Combining notes of ginger and cinnamon, for heat and spice, with osmathus flower, green coffee and smoked beechwood, for vibration, this fragrance manages to be both fresh and warm with a hint of spice but not too heavy. I would describe it as an invigorating and uplifting scent without being aquatic or citrusy. It's neither overpowering nor subtle and it lasts for a good 6/7 hours on the skin. It is housed in a bottle similar to the original Alien Man fragrance but in a stunning midnight blue colour. with contrasting silver detail Available in 50 and 100ml bottles, starting at £47 and on sale from today. Alien Fusion For Her: Housed in a stunning ruby red bottle with gold accents, it looks like a precious gem. Described as being fiery and sensual, this fragrance combines notes of sambac jasmine for sweetness, ginger and cinnamon, for heat, with rich tuberose, orange blossom, creamy vanilla and white amber for depth. The result is a very unique scent - initially, it smells almost like a smokey floral but as it dries down, the warmth of vanilla and spice of ginger combine to create a sensual and slightly spicy scent. As its an Eau De Parfum, it lasts well on the skin - I find a good 8 hours at least. This is definitely for those who like rich, warm scents and would work best as an evening fragrance, in my opinion. Available in 30 and 60ml bottles, starting at £49. On sale from today. Are you a fan of the Mugler Alien line? Do you and your other half celebrate Valentine's Day? I'd love to hear! All products are bought by me, unless otherwise stated. These fragrances were kindly sent to me but this is not an ad as I was not paid to mention them. Opinion is always my own. Affiliate links may be used.